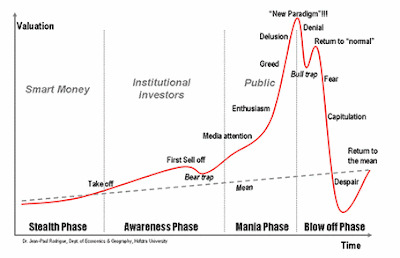 Hat tip to Alex Stanczyk of the rapidtrends newsletter who dug out this chart depicting the various stages of a bull market/bear market. The massive correction in silver brings back Indian buyers. According to a Reuters story, Indians also shift to silver as the high silver/gold ratio of 80:1 makes the white metal appear cheaper to its competitor gold. Imports have jumped to 250 tons every month since August after a dull first half 2008 when record prices repelled buyers. Silver dramatically undershot my worst case scenario of a low at $14, trading briefly below $9 before it recovered to the current level around $10. The silver miners got knifed accordingly, playing out the bad side of beta with losses of up to 90% this year. But the Indian buying spree and losses in production because base metals mines are closing due to the price slump may be a solid base for the next upleg on fundamentals. MUMBAI, Oct 20 (Reuters) - Indian traders may not be buying much gold with prices close to all-time highs, but are scrambling to stock up on silver that fell to its lowest in a little more than a year, dealers said. "There is already a shift from gold to silver... people are very comfortable with silver prices," said Ajay Singh of Kiran Jewellers, a wholesaler in Jaipur. Singh said his silver sales had risen five-fold from the same period last year, ahead of key festivals, Dhanteras and Diwali, next week. On the continuation charts of the Multi Commodity Exchange of India Ltd (MCX), silver futures MSVc1 were at 17,541 rupees per kg, close to a 13-month low struck late on Friday at 16,857 rupees. The current price is down 36 percent from its record high at 27,500 rupees on March 17. Suresh Hundia, president of Bombay Bullion Association, said silver imports had accelerated since August, and demand was heavy early this month, when prices were in the range of 19,000 rupees and 20,000 rupees. "Earlier in the year, there was hardly any demand but now since August, about 250 tonnes is being imported every month," Hundia said. Yet, imports stood around 800 tonnes so far this year as against around 2,280 tonnes in all of last year, he added. Supplies "Starting to Get Tough"
Many traders said silver imports hit bottlenecks even at high premiums, with a global demand resurgence, difficult credit market and logistical woes. "Many banks are unable to get silver even if we tell them we will give them the full sum of money for the consignment," said Daman Prakash, director of MNC Bullion Pvt Ltd, a wholesaler in Chennai. "There is shortage of space in flights and that is curbing the supplies," said Prithviraj Kothari, director at Riddisiddhi Bullions Ltd.
A prominent Geneva-based supplier, Afshin Nabavi, senior vice president at MKS Finance S.A., said supplies were "starting to get tough." "There is a huge demand for silver... it has not been this cheap for a while now," Nabavi said. Banks are ill prepared for the resurgence in demand and at least one large bank has chosen not to sell silver this year, traders said. "Earlier this year banks were stuck with stocks and some had to think about re-exporting it," said Kiran Jewellers' Singh. "Now they are not being able to arrange supplies.. whoever reaches them first or those who have good contacts are getting the little silver that is coming in." Silver was being imported at a premium of 35 cents as against 10 cents in normal times, dealers said. Demand for the white metal could intensify if prices fell further, said Nayan Pansare, an analyst. "At 15,000-16,000 rupees we could see a bigger rush for silver and more switches from gold to silver," Pansare said. I would say this is another sign that the dichotomy between COMEX silver prices and prices paid is more then questionable. Both the metal as its producers may be a a once in a lifetime opportunity at current price levels that are destined to change dramatically, only to catch up with inflation. The inflation adjusted all time high of silver is in excess of $135 per ounce and there are so many signs of a physical shortage when silver sold short on the COMEX now exceeeds one year of global production. The gap between rich and poor has grown in more than three-quarters of OECD countries over the past two decades, according to a new OECD report . OECD’s "Growing Unequal?" finds that the economic growth of recent decades has benefitted the rich more than the poor. In some countries, such as Canada, Finland, Germany, Italy, Norway and the United States, the gap also increased between the rich and the middle-class. A key driver of income inequality has been the number of low-skilled and poorly educated who are out of work. More people living alone or in single-parent households has also contributed. Children and young adults are now 25% more likely to be poor than the population as a whole. Single-parent households are three times as likely to be poor than the population average. And yet OECD countries spend 3 times more on family policies than they did 20 years ago. In developed countries, governments have been taxing more and spending more on social benefits to offset the trend towards more inequality. Without this spending, the report says, the rise in inequality would have been even more rapid. “The largest part of the increase in inequality comes from changes in the labour markets. This is where governments must act. Low-skilled workers are having ever-greater problems in finding jobs. Increasing employment is the best way of reducing poverty,” he said. Better education is also a powerful way to achieve growth which benefits all, not just the elites, the report finds. In the short-term, countries have to do better at getting people into work and giving them in-work benefits to provide working families with a boost in income, rather than relying on unemployment, disability and early retirement benefits. Find the specific data on all OECD countries here. Sorry for missing out on such first-in-a-lifetime-headlines like "Eurozone Throws €2.3 TRILLION At Banking Debacle and It Will Not Be Enough" or "Politicians Still Not Realizing What Kind Of Financial Tsunami Is Right Ahead Of Us" due to a stubborn flu. But I think a lot of the political talk that fills airwaves and newswires as a recession is engulfing Europe will never have been more than hot air. Reasoning that we are at the point of no return on the way into a drawn out recession if not depression because politicians are only demonstrating helplessness while the global margin call would have required action since 2006, I stand by my opinion that Euroland is destined for surging monetary inflation in the near future. The latest datapoint is a very remarkable one. 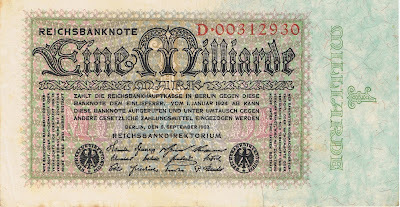 While EU politicians keep on talking about a unitary solution to the banking debacle, the ECB quietly rumps up its money creation to Weimar style. While TV would have offered me Madonna's divorce settlement and all details around, the more interesting information is to be found on the ECB's website. Just watch the chronological order and discover that the ECB will flood the market with any amount of new debt until a political situation will be found. The latter may take a lot longer due to the varying size of the EU banking debacle in its member states. ECB president Jean-Claude was on tour de calm on Monday with a speech titled "The financial turbulence: Where do we stand?" At that stage he suggested more and more fresh Euros to come until politicians would find a solution to the crisis that begins to hurt the real economy almost overnight. Trichet also suggested there will be more government intervention. This plan has six dimensions: ensuring appropriate liquidity; facilitating the funding of banks through various means (guarantee, insurance or similar arrangements for new medium-term – up to five years – bank senior debt issuance); providing additional capital resources to financial institutions; recapitalisation of distressed banks; ensuring appropriate implementation of accounting rules; and enhancing cooperation among European countries. Tuesday was filled with various governments reassuring savers that their money would be safe in the bank. That day European taxpayers were taking on a risk of potentially €2.3 TRILLION. Prove me wrong for €500 million up or down from that figure. Each Monday, starting on 20 October 2008, the Eurosystem and the SNB will conduct EUR/CHF foreign exchange swaps providing Swiss francs against euro with a term of 7 days at a fixed price. The fixed price and the maximum amounts allotted by ECB and SNB will be announced before the operation. The list of assets eligible as collateral in Eurosystem credit operations will be expanded as set out below, with this expansion remaining into force until the end of 2009. As from the operation settling on 30 October 2008 and until the end of the first quarter in 2009, the provision of longer-term refinancing by the Eurosystem will be enhanced as set out below. The Eurosystem will start offering US dollar liquidity also through foreign exchange swaps. The details offer the expected: As long as you have any crap to offer as collateral, we will take it and give you unbacked Euros. As much as you want. The threshold is very low and so are the haircuts to the securities the ECB will accept as collateral. Marketable debt instruments denominated in other currencies than the euro, namely the US dollar, the British pound and the Japanese yen, and issued in the euro area. These instruments will be subject to a uniform haircut add-on of 8%. Euro-denominated syndicated credit claims governed by UK law. Debt instruments issued by credit institutions, which are traded on the accepted non-regulated markets that are mentioned on the ECB website; this measure implies inter alia that certificates of deposits (CDs) will also be eligible when traded on one of these accepted non-regulated markets. All debt instruments issued by credit institutions, which are traded on the accepted non-regulated markets, will be subject to a 5% haircut add-on. Subordinated debt instruments when they are protected by an acceptable guarantee as specified in section 6.3.2 of the General Documentation on Eurosystem monetary policy instruments and procedures. These instruments will be subject to a haircut add-on of 10%, with a further 5% valuation markdown in case of theoretical valuation. Furthermore, the Eurosystem will lower the credit threshold for marketable and non-marketable assets from A- to BBB-, with the exception of asset-backed securities (ABS), and impose a haircut add-on of 5% on all assets rated BBB-. All these measures spell I-n-f-l-a-t-i-o-n to me. The numbers back up the fear gripping credit markets. In order to keep the Eurozone banking system afloat, the ECB accepted all offers with a volume of €310 billion at its latest 7-day tender at the fixed rate of 3.75%. Okay, in these days where TRILLIONS swarm in the thin air, a paltry €310 billion, basically a tad more €1,000 in future tax payments for every Euroland inhabitant, wont really make one scratch his head. But this figure certainly turns into a zombie robbing my sleep. The ECB has lent out "only" €445 billion toxic liquidity since the beginning of the crisis in August 2007. While this may still sound tame in the face of a looming derivatives default, potentially worth almost $600 TRILLION, the ECB keeps the spigots wide open. Only on Thursday we saw a $170 billion 7-day repo while politicians were still talking about a common solution to the crisis. These ongoing fixes may buy some time, but politicians run the imminent risk of skyrocketing monetary inflation if no plausible solution is brought forward in a few days. Markets partially expect this too, but what is a 5 basis point change in the LIBOR these days? The Euro weakness also reflects the key structural deficit of the common currency. It has no treasury standing behind it. (And I would raise to arms if the EU would propose such a thing.) It is a fiat currency par excellence, backed by nothing than the diminishing belief that today €100 would buy you the same amount of services or goods in the future. Eurozone inflation will probably bachtrack in October due to the crash in crude prices. The spiral of fear is pre-programmed anyway already. Merchants are unwilling to lower prices in expectation of a resurge in commodity prices and employees are demanding wage raises in the high single digits. Always eager to helicopter Euros around the world the ECB also entered into a "cooperation" with the Hungarian Central bank which is no Euro member. I am confident we will see the ECB lending explode in the unknown world of TRILLIONS of new debt within a few months that may be everything but not the salvation before the sad end of capitalism that has gone bonkers in this millennium. The next step will be surging government intervention. After a wave of state guarantees that are anyway coming out of the pockets of taxpayers EU countries will hammer down new sets of regulation of the banking sector. This will come hand in hand with more nationalizations. Tiny Austria may even go so far as to expropriate bank share holders without the possibility of an appeal, the Austrian daily "Der Standard" reported on Wednesday. Karl Marx must be having a good drink in heaven these days and I will soon come up with another post on the doubtful future of the Euro. Financial news have been coming fast and furious in the past four weeks, taking the nationalization of Frannie as a starting point for the worst turmoil any living market participant has experienced in his/her life. What we have seen since can only be called monetary madness where central banks and governments ultimately saddle more than one generation of citizens with debts for the rescue of a financial system that ultimately cannot be successful by generating still more debt. It has become almost impossible to follow all inflationary measures disguised as "liquefying operations" by monetary authorities. At the same time governments begin to blow up future inflation expectations with their unlimited guarantees of savings deposits that have a good possibility of blowing up in their face. Socialism for the haves has become commonplace almost overnight in Europe. After Ireland and Greece governments in Germany, Austria, Denmark, Sweden and the UK followed suit in a move to reassure savers that their money is safe in a bank. We can be confident to hear similar announcements from more countries in the near future. Not even bankers agree in private that this is the case, being grateful that the non-financial world is still not aware of the debt Himalaya that starts crashing upon the world and has not yet led to a massive run on continental European banks which are bleeding on all ends. Central banks meanwhile keep trumping themselves who will create more money without a correspondent value. But the pinstriped inflationistas have only a single strong card left in their hands. 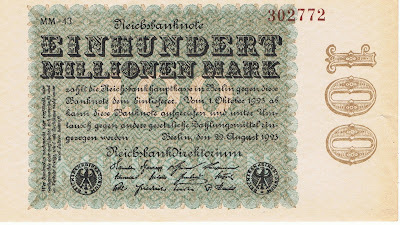 It is the card of public ignorance and the blessing that nobody can remember the last periods of hyper inflation. This will change as soon as the public will see that the next bank run will not be the last one. At this point of time the banking crisis will have become toxic for the broad economy. Anything real estate related, insurance companies and the leisure sector will feel the pinch next, either from hard to get credit or falling bond prices or the disappearance of disposable income due to rising prices. Do not mistake the current correction in commodities as a bear market. It is rather another result of the global margin call taking place right now. Climbing spreads in the fixed income markets show the dichotomy between market reality and the wishful thinking of central bankers who increasingly lose power over their only tool, establishing leading interest rates for the short end of the market. The game can go on as bankers and investors are so foolish to accept negative real rates. This behavior will stop soon, once the tightening continues. And I see no step so far that is designed to restore confidence in a market where participants would like to adapt accounting rules to converge with their wishful thinking. Sorry, the signs have been on the wall for at least four years. Money supply and debts first grew in the USA and the EU and this dangerous policy was followed by countries at such diverse stages of development like China, India and Russia which are all fighting the same inflation problem by now. The avalanche of cheap credit pumped out by central banks does not reach the broad economy and consumers in Europe anymore as banks scramble to improve their balance sheets. This may become a roadblock for the ailing economy, already limping ahead at growth rates that fall within the statistical margins of error. 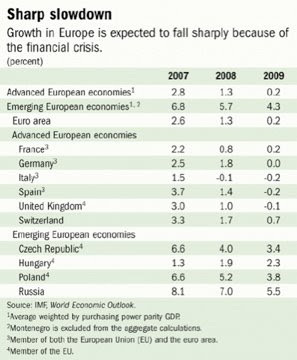 As all measures since August 2007 have not helped to alleviate the crisis we probably have to get ready for a very brute and nasty crash that will do what a crisis is here for: to cleanse out the weak part of the economy and start again with a clean plate. I know this euphemism does no justice to the economic contraction which will cost many their existence the way they have known it. But no authority in the world has ever been able to prevent a depression by decree or by printing money in limitless amounts. It only fuelled inflation further, without any historical exception. Don't think it will be different this time. All economic and financial indicators have long surpassed the toxic levels that led to the 1930s depression. Oh, yes, one thing will be different: This time it will be global.